American Friends Service Committee (AFSC) - Carries out service, development, social justice, and peace programs throughout the world. Also see Youth and Militarism. AWOL in Canada - The War Resisters Support Campaign in Toronto has been actively supporting U.S. war resisters in Canada since early 2004, helping them and their families to find Canadian lawyers, housing and jobs, coordinating hundreds of media and speaking engagements, organizing benefit concerts, and initiating a national petition campaign calling on the Canadian government to provide sanctuary for all war resisters. Center on Conscience and War (CCW) - Works to defend and extend the rights of conscientious objectors. Services are provided to the public at no charge. CCW participates in the G.I. Rights Hotline, a national referral and counseling service for military personnel. In the event of a military draft, CCW will assist in the placement of conscientious objectors in alternative service programs. The Center is opposed to all forms of conscription. CO Update - Newsletter of War Resisters' International's The Right to Refuse to Kill Program. Central Committee for Conscientious Objectors (CCCO) - Since 1948, helping people who get caught in the military's web. Also see GI Rights Hotline. Code Pink - A women-initiated grassroots peace and social justice movement working to end the war in Iraq, stop new wars, and redirect our resources into healthcare, education and other life-affirming activities. Also see the Support War Resisters, Military Recriuters Lie, and Five Years too Many pages. Eyak Preservation Council - At the heart of all of EPC's work are the wild salmon, their pristine habitat and the ecosystems that not only sustain the returning salmon but also the traditional heritage and economies that depend on them. Currently, the U.S. Navy is applying for authorization to train in the Gulf of Alaska for the next five years (2016 - 2020). Eyak significant concerns about the negative or unknown impacts these trainings could have on the ecosystem and communities. GI Rights Hotline - Provides free, confidential, and accurate information on U.S. military regulations and practices to servicemembers, veterans, potential recruits, and their families. Iraq Veterans Against the War (IVAW) - Founded by Iraq war veterans in July 2004 at the annual convention of Veterans for Peace (VFP) in Boston to give a voice to the large number of active duty service people and veterans who are against this war, but are under various pressures to remain silent. Supports war resisters and conscientious objectors. Learn more about service men and women who are presently refusing to participate in the occupation of Iraq. Also see Resources for Veterans. Military Law Task Force - The National Lawyers Guild Military Law Task Force assists those working on military law issues as well as military law counselors working directly with GIs. It trains and mentors counselors and beginning military law attorneys in all aspects of military law through training materials and direct communication. Project YANO - Provides young people with an alternative point of view about military enlistment. In its base community of San Diego County, Project YANO sends veterans to youth groups and local schools to speak about the realities of military life and war so that young people will better understand what is behind the armed forces sales pitch. As an alternative, students are given nonmilitary options for local job training and college financial aid. Project YANO also urges youths to become community activists and consider pursuing careers in social change. Soldiers for the Truth (SFTT) - Founded by Col. David H. Hackworth, USA (Ret). An organization of citizens and veterans working on issues confronting U.S. Soldiers, Sailors, Airmen, Marines and Coastguardsmen relating to training, welfare, benefits, equipment and leadership. Veteran's Project, The - Helps military veterans reintegrate into society when they come home. Its mission is to remove the stigma associated with post-traumatic stress, and raise operating funds for groups that provide psychological care and job training to veterans in the aftermath of war. War Resisters International (WRI) - An international anti-war organization with members and affiliates in over thirty countries. Its headquarters are in London, UK. Also see The Broken Rifle, internal newsletter of WRI. War Resisters Support Campaign - Calls on the Canadian government to demonstrate its commitment to international law and the treaties to which it is a signatory, by making provision for U.S. war objectors to have sanctuary in Canada. Winter Soldier Investigation (1971) - An event sponsored by the Vietnam Veterans Against the War intended to publicize war crimes and atrocities by the U.S. Armed Forces and their allies in the Vietnam War. 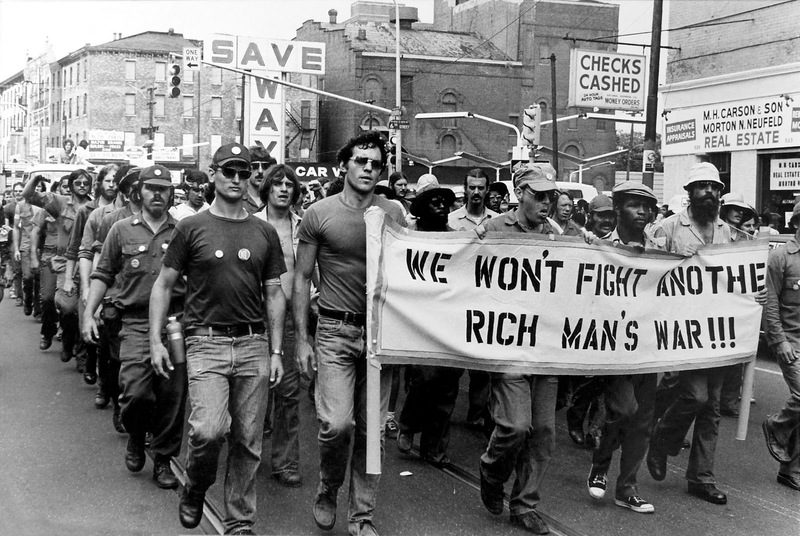 The VVAW challenged the morality and conduct of the war by showing the direct relationship between military policies and war crimes in Vietnam. This site provides transcripts of the testimony given in Detroit, Michigan, on January 31, 1971, February 1 and 2, 1971. Also see Wikipedia article. Women Against Military Madness (WAMM) - A nonviolent, feminist organization that works in solidarity with others to create a system of social equality, self-determination and justice through education, action and the empowerment of women. WAMM's purpose is to dismantle systems of militarism, economic exploitation and global oppression. This webpage last updated on Thursday, August 24, 2017 3:37 PM.